Born in 1978 and raised in Nevada, baritone sax and low wind instruments specialist Brian Landrus is now based in Brooklyn. 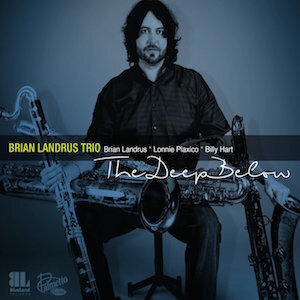 Having founded his own label, BlueLand Records in 2011, his first releases of all original music were “Traverse”, a quartet outing with Lonnie Plaxico, Billy Hart and pianist Michael Cain, and “Capsule”, by The Brian Landrus Kaleidoscope with Cain, guitarist Nir Felder, bassist Matthew Parish and drummer Rudy Royston. In 2013 Landrus released a second Kaleidoscope album, “Mirage”, featuring Felder, Royston, Plaxico and Frank Carlberg on piano with string quartet led by violinist Mark Feldman. For this release things have been stripped right back to the core. Landrus is joined by his regular bassist Lonnie Plaxico and drummer Billy Hart. “The Deep Below” is a balanced set of originals and classics, all performed in standard trio format. That said, there’s nothing standard about the performances here, Landrus’s deep, soulful, lyrical blowing is perfectly backed up by Plaxico and Hart, creating an album with a cool, rich depth to it. Landrus plays baritone sax, bass clarinet, bass flute and bass sax, all with a lithe virtuosity, breathing life into his characteristically probing originals and the excellent interpretations of classics by Duke Ellington and John Coltrane, along with an intimately affecting take on the Sinatra ballad “I’m a fool to want you.” One of the key things with this recording has to be the fact that Landrus always keeps things interesting; the nature of the instrumentation allows for some excellent interplay between the three musicians whilst offering up an elegance and sophistication one wouldn’t immediately associate with the reed instruments being used. The clarity and strength of the writing is also evident, particularly on tracks such as the opener “Fly”, with its fluid lyricism, and the haunting “Will She Ever Know”. Landrus seems to compose in a thoughtful way, with a particular instrument in mind – at least that’s how it sounds – with each and every track having its own clear vision. “It Comes Together At The End” and “The Beginning” are performed with such soul and character, they leave this listener hanging on to every note, feeling the vibe and sensing a hint of deep spirituality flowing through Landrus’s every breath. The talented reedsman uses nothing more than bass clarinet on the pieces “Just A Fading Memory” and “Open Water”, creating a delightful world of his own; one that is open to all who care to listen. Whilst the playing on “Giant Steps” leaves the listener breathless, the playful exuberance of “The Age” leaves its reward in the physical form of a big smile. The more I listen to this album, the deeper I get drawn in. Plaxico and Hart are attentive and thoughtful when appropriate, and swing with fervour when the right moments are presented to them. Landrus is a storyteller of old, spinning his tales with authority and sincerity… Yet it is an undefined beauty that shines through. Allow yourself to be taken, let yourself drift into “The Deep Below” – therein rests a hidden treasure waiting to be discovered.